Rural Electrification board (REB) Job Notice 2019 has been published. BREB Authority Release PBS jobs circular 2019 Today. Then We Collect This company job From Thier REB Website. They Want Some Eligible and Energic Young Female For Assistant Cashier. If you are ssc, hsc, honours pass student. 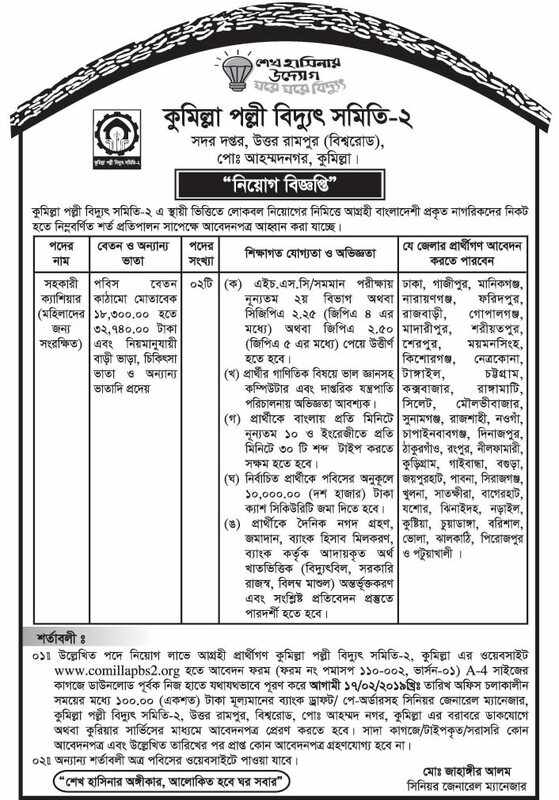 you should apply to the Polli biddut Somiti job related circular. here you can download PBS job application form. It’s an Attractive Non-Government job in 2019. Every Educated Jobs Seekers Young family Want To Join rural electrification board (reb). Because During Job in Reb, You Will Get more And More Facilities as polli biddut somity job circular. This Reb Recent Job Notice is Great Opportunity For You. So Check Out The Reb Jobs Circular as Original JPEG File. Below You Will You All Information About www.reb.gov.bd. Job Type: Non-Government Job Circular 2019. Age limit for jobs: 18-30 Years. But For Freedom Fighter Son’s Age have Til 32. Jobs Source: As per Polli biddut Somiti Notice Board. Application Fee: See the Circular. Education Qualification: HSC pass (Second Class). Other Qualification: Eligible Candidate Will Expert In Computer Typing. Salary : 18,300- 32,740 Taka. Other Benefits: As per Companies. I Think You Read The PBS Job Notice. As Many Circular have in Edujobd.com. We Publish Daily based latest and Hot job circular news For bd Job Seekers. Our main purpose helps the jobless for their Bright future and we Believe that our published Dhaka job recent Notice help the who is finding deserve the job. We also give careers tips to anybody. For seeing more update visit Our Website as well as like our Facebook page Chakrir Khobor and National University Updates. Thanks For Stay.